13 Corine Lane in Singleton Beach is a fantastic home with a private pool! High end style at a moderate price! 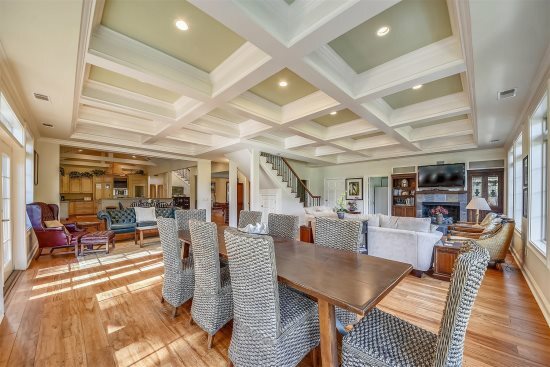 This luxurious home will fit all your desires for luxury at the beach and not break your wallet. Plenty of space in this 3,500 sq. ft., 6 bedroom, 6 and a half bath beautiful home, set in a lovely neighborhood setting. Professionally decorated and plenty of room for everyone, this stunning home has 3 king beds, 3 queens beds 5 twins and a queen sleeper sofa, sleeping 16 people. Less than a half mile to beautiful Singleton Beach, this home is centrally located and has easy access to shopping, close to the Northridge Cinema, grocery stores, a lovely park and recreation area. An oversized garage allows for additional parking, and the driveway can accommodate two vehicles. Up the steps to the front door will take you to the main level of this home with open galley style chef’s kitchen with a European design, granite countertops, stainless steel appliances and custom cabinetry. The chef of the house will be absolutely delighted. The dining area with seating for eight at the table and six more at the kitchen bar, will be the center of attention when gathering for meals. The living room is very comfortable and done in soothing Earth tones, has a huge flat screen TV mounted above the fireplace, which is decorative only. The master bedroom on this level has a king bed and is done in a French Provincial décor. The master bath has a wonderful shower and granite countertops here as well. The second floor of this lovely home has another master with king bed and private bath with a soaking tub and separate shower. Beautifully decorated bedroom with a mounted flat screen TV. There is another bedroom on this floor with a queen bed and full bath with a tub/shower combination which offers another flat screen TV. The third floor is where you will find another king bedroom, private bath and the twin bedroom that has 3 separate twin beds, 2 of them having trundles. Another bath for this bedroom is on this level and has a tub/shower combination. There is a laundry room with full size washer and dryer and a separate room with another dishwasher and microwave for popping some popcorn and watching a great movie! The private swimming pool is under cover so should be cool and refreshing on those hot summer days, patio furniture and a gas grill complete the fenced backyard. 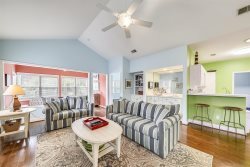 This is the perfect home for your next vacation to gorgeous Hilton Head Island. 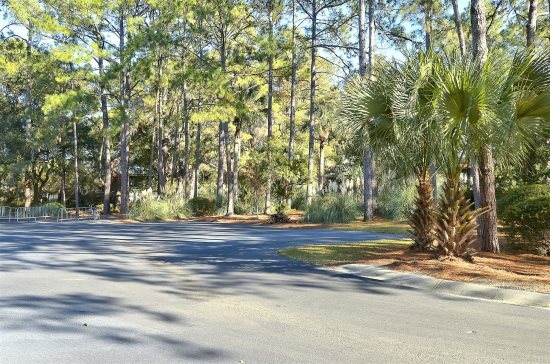 This mid island location is close to all of the island's many attractions. Directly across the street is Chaplin Park, which offers ball fields, tennis courts, and basketball courts. There is even free golf cart shuttle service to the beach during the peak season. The service runs every day except Saturdays. Pool can be heated from September to April. Very enjoyable, met all our needs,Love the area ,we felt very safe a d secure. Each house had the right amount of privacy.